New/unworn Omega Constellation Globemaster Co-axial Master Chronometer Annual Calendar 130.33.41.22.02.001. 41mm Stainless steel case. Silver "Pie Pan" dial with blue hands and index hour markers. Blued Constellation star and OMEGA logo, and blued facetted hands and indexes which have been filled with Super-LumiNova. Luminescent hands and markers. Date display at the 6 o'clock position. Fixed stainless steel bezel. 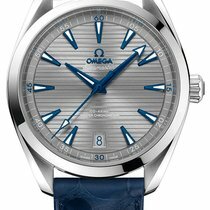 Omega Calibre 8922 automatic movement. Domed Scratch resistant sapphire crystal. The case back includes a Central Observatory medallion set in scratch-resistant sapphire crystal. Brown leather strap with a deployment clasp. Water resistant at 100 meters / 330 feet.